The Great White Shark is most commonly found in temperate seas, such as those found off the coast of North America, southern Africa, Australia and New Zealand, parts of the Mediterranean and Japan. It is able to make long journeys across deep waters, but prefers coastal waters, where there is plenty of food to be had. This food consists mainly of fish and sea mammals, especially seals. Great Whites are known to visit the same sites each year, following the seal colonies during their breeding season. The Great White Shark's eyes are specifically designed for hunting. They roll back into their sochets, conveniently, just before an attack, which prevents damage to the eyes. They are also excellent swimmers (obviously). Its smooth, streamlined body allows it to swim all day without wasting energy, which is effective when hunting large prey like seals, tuna and dolphins. In addition to searching for prey, the shark must keep moving to force oxygenated water through its gills. 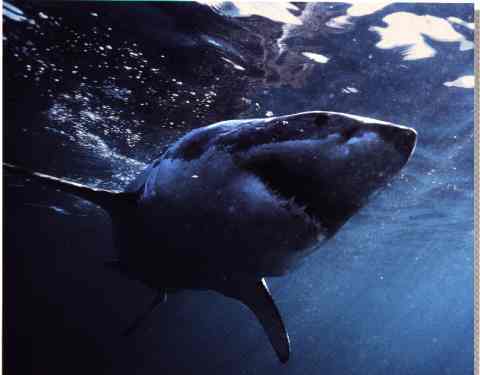 Great White Sharks usually live from 30 to 50 years. The age of maturity is about 7 years. They weigh between 6,000 and 7,000 pounds and measure from 12 to 20 feet. The female is usually larger then the male. This is also the only shark which regularly attacks warm-blooded animals such as seals and dolphins. Great Whites are rare, and becoming more so by the day. 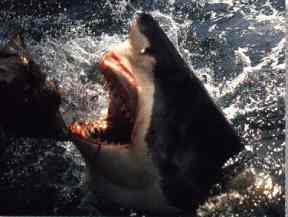 It is said that most victims of a Great White attack survive, suggesting that they do not like the taste of human flesh (fortunately). However, their reputation causes a great many of these animals to be killed, for no other reason than they MIGHT be a danger to humans. This must be stopped. I would not want to meet a Great White in his own environment, whether he likes the taste of human flesh or not, but I don't imagine he'd do much better in my world! Let them be...they are one of the Earth's most amazing creations.